This little figure has a quite a history, and continues to have quite a following. But why? 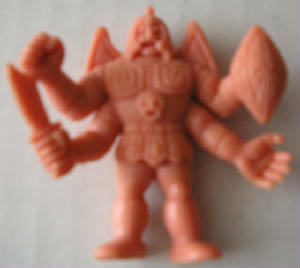 This figure is the only M.U.S.C.L.E figure that was not found on the poster. Because he was not on the M.U.S.C.L.E poster there was some debate as to whether he was truly a M.U.S.C.L.E. He had the appropriate marking, look, feel, and even smell – but he wasn’t on the poster. The debate as to his authenticity ended when he was found in a sealed 4 pack. A strange thing happened after that. He suddenly was declared “rare” when he should have been more appropriately titled “desirable”. Collectors were suddenly ready to shell out exorbitant amounts of money for this small piece of plastic. It is understandable for a figure’s value to increase based on supply and demand. But there had become, what I believed, to be a false sense of scarcity. From April 2003 through April 2007 I tracked the appearance and final sale price of every eBay auction that contained a Satan Cross. I have attempted to present these findings as simply as possible below. Hopefully this will help collectors save their money, learn a little patience, and provide a realistic value for our little friend – Satan Cross. The first value is simply the mean. For this value I simply took the final sale price for each auction and divided it by the number of figures in the auction. If there were additional items in the auction (wrestling rings, posters, etc.) I did not account for them. April 2003 - April 2007 there have been 127 auctions on eBay that have contained a SC. The second value is also a simple mean. Except this computation was only done for auctions that only had figures. April 2003 – April 2007 there have been 108 auctions on eBay that have contained a SC. 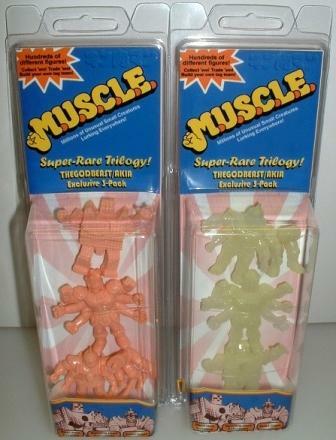 The third value attempts to account for the other M.U.S.C.L.E.’s having an approximate value, and being in auctions with only figures. Many collectors believe that an average M.U.S.C.L.E has a value of 50 cents. For this computation the number of figures in the auction (minus one for the SC) was multiplied by .5. This value was then subtracted from the final sale price, which resulted in the SC’s value. Because M.U.S.C.L.E lots on eBay do not always sell for more than 50 cents per figure it resulted in some negative values. For this computation they were left in when the final value was created. Computations 5 and 6 account for these negative values. April 2003 – April 2007 there were 108 auctions on eBay that have contained a SC, selling only figures. The fourth value attempts to account for the other M.U.S.C.L.E.’s having an approximate value, and being in auctions with only figures. Some collectors believe that an average M.U.S.C.L.E has a value of 75 cents. For this computation the number of figures in the auction (minus one for the SC) were multiplied by .75. This value was then subtracted from the final sale price, which resulted in the SC’s value. Again negative values were not removed. This computation was identical to the third computation, except negative values were removed from the final computation. April 2003 – April 2007 there were 103 auctions on eBay met the criteria for this computation. This computation was identical to the fourth computation, except negative values were removed from the final computation. April 2003 – April 2007 there were 89 auctions on eBay met the criteria for this computation. This is my Satan Cross. This is the version that was released in the U.S. This Japanese version allows you to see the piece that was supposed to attach to the hole on his back. I wish that I owned this piece, but that honor goes to Doc Moore J (Jason). This is original, and was not a clever “custom” or re-seal. These figures (flesh color on the left, and glow-in-the-dark on the right) were created by Godbeast (Marty) with Tortle (Nathan) doing all of the graphics. While this is a different version of the Satan Cross it was the only way for many collectors to own these three “Super Rare” figures. This is, in my opinion, the best display of a Satan Cross. 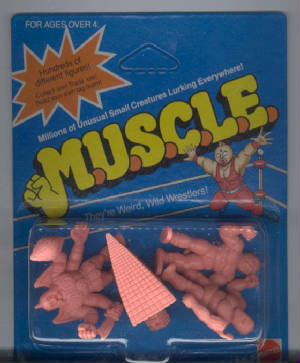 I’m a sucker for packaging, and this is arguably the best piece of M.U.S.C.L.E packaging.